Keeping with our last couple weeks we are launching another big name slot at Fly Casino. 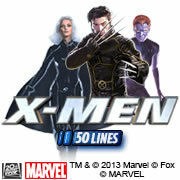 X-Men 50 line takes our already hugely popular X-Men slot and takes it to another level. Enjoy 50 pay lines of excitement starting today. This game boasts the X Feature, which wins a mixed pay cash prize. It also has free games with two different variations with both Heroes and Villains modes. Don't forget all Marvel Slots at Fly Casino are apart of the massive Marvel Jackpot pool. Right now its over $230,000.00! Have a question? Get it answered anytime now at Fly Casino. Recently we have taken our live chat support to a full 24 hours of coverage. Our helpful staff is always around to answer any questions or concerns you may have. You can reach them by clicking on "Online Support" in the download client or "Support" in an opened flash game.